Anita and I spent five nights in Istanbul (not Constantinople) last week. We were off to a good start. Coming off the plane the first order of business was getting money from an ATM in the airport. The machine would make the right noises but not spit out any money. Luckily a different one worked. Now the only problem is getting the money back from my original attempt as, of course, my account has been charged. This is the largest city I have ever been to with an official population of 14 million and an estimated true population of 16 million. It has grown tremendously in the last few decades and the infrastructure hasn't kept up. Traffic is a complete nightmare. There are more than 2 million people commuting across the only two Bosphorus bridges from the Asian to the European side every day. Everybody is always hustling. This is fun at first but really got on my nerves after a while. 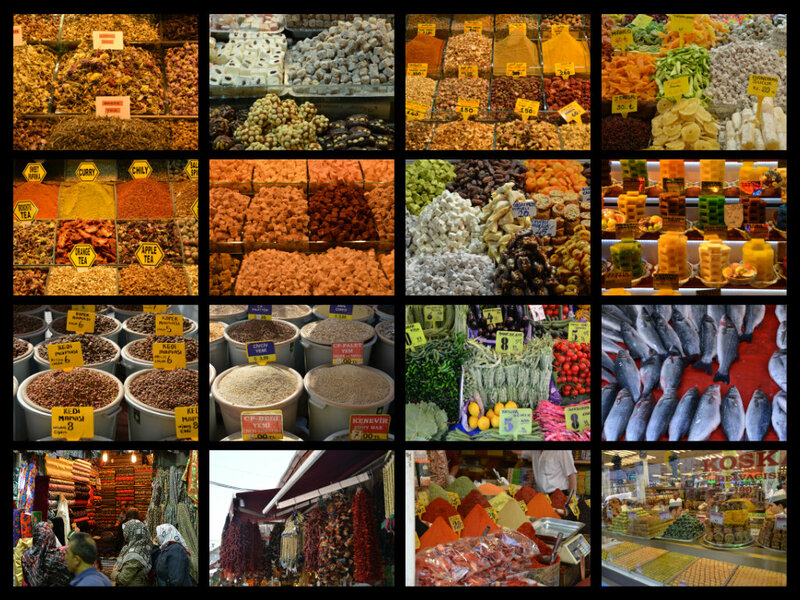 Istanbul has a beautiful and huge historic Grand Bazaar which is sprawling with merchants and tourists. 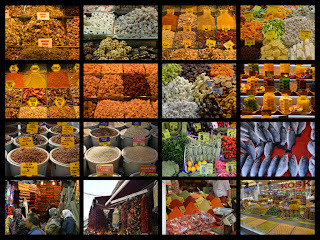 However, the concept of a Bazaar is really meaningless, as every single street has been turned into one. Shopkeepers are standing in the streets, luring people in. Flying merchants have set up shop in every available nook. Restaurant waiters aggressively solicit passerby. If you are not in the mood to buy you are constantly running the gamut, avoiding eye contact and very explicitly demonstrating disinterest. Begging seems to be forbidden, at least we didn't see any straight out beggars. What you get instead is poor people sitting in the streets selling tissue or the service of taking your weight with a simple body scale. Quite an elegant work around I think. In the same vain we didn't see any street artists or street performers/street musicians at all. In a city bustling with tourists this came as a surprise to me. A cultural thing? - Dogs. While we saw a handful of strays having a dog as a pet seems to be a foreign concept. I for one liked the city much better for it. - Bikes. In our entire time there I saw exactly three people on bicycles. Understandable really as it requires suicidal tendencies and recklessness to ride a bike in that traffic. - Female shop keepers. We only saw a handful of waitresses and chambermaids. All other occupations seemed to be exclusively reserved for men. - Prices. Hardly any of the wares on display have marked up prices. Every transaction is a negotiation. We've paid prices all over the map. Sometimes a factor of 5 or more for essentially the same services. Depending on our mood to haggle and the tourist rip off level of the seller. Two things made this difficult for me. One is simply annoyance. Sometimes I want the convenience of simply buying a bottle of water in a 3 second transaction instead of having to negotiate the price for 5 minutes first. Second is that I'm missing an anchor for the right/fair price. Do I want to pay local price? Do I want to pay non-tourist rate? Am I happy with just getting it cheaper than at home in Switzerland (at which point I could flat out pay just about any price the Turkish merchant demands)? It is a bustling city very much alive all around the clock. A city of huge contrasts. You get dirt poor people living in the street next to the Çirağan Palace Hotel Kempinski offering a night in the Sultan's suite for $7500. You meet fully veiled women in their Burkas standing next to the modern compromise of a headscarf next to a girl in mini skirt and tight top. You see crumbling ancient houses next to modern high rises of glass and steel. Hand-drawn carts next to Porsches. Exciting. Colorful. Posh roof terrace vs decay. Tourist lawn vs public beach. Getting food every night was an adventure. We took to calling it "menu roulette". Most restaurants are very accustomed to tourists and offer menus with pictures of the food. You point at something to order it. Then you get something completely different. I think on average we've been pleasantly surprised more often than negatively. Two incidents stand out in my mind. One night we strayed a bit off the beaten track and ended up in a street that had no passerby, tourists or locals. One restaurant right next to the other though. A lot of men were standing around, waiting to grab unsuspecting victims like us. Sitting down on the outside and ordering food we noticed that this "restaurant" seemed a little different than the others. Inside a lot of scantily clad women were sitting around waiting... Our food came late, and, not from the place we were sitting at. Instead, the waiter had gone off to some other restaurant to bring food from there. The night ended with a conversation with the local master pimp. He liked my hat so much that he took out his phone and showed me all of his private photo collection boasting that he sported a similar hat. My hat was a great attraction and conversation starter in general. People would constantly shout out Indiana Jones!, Dr. Jones!, Mr Cowboy!, Crocodile Dandy! and similar. The other night we again were wandering away from the usual tourist streets. We ended up in dimly lit, cozy back alleys with locals sitting on small stools drinking tea. I was about to join some of them when Anita pointed out that for half an hour we hadn't only been the only tourists around but she was also the only woman. This understandably made her feel a bit uneasy. It reminded me of an article arguing for the need for women only events. One reason was that a man entering a room never pauses to doubt whether he should actually be there while women, often being the only female in the meeting, often do. Guilty as charged. We went to see most of the big mosques, including the Hagia Sophia, the Blue Mosque and the Süleymaniye Mosque. Outstanding architecture. In my eyes they easily best our European churches. I much prefer the clean elegant geometric lines of the mosques to the gothic ornamental chaos of our churches. Constructing such monumental domes is a pretty unparalleled feat of engineering. In an earthquake area to boot. The way individual stones have been cut with puzzle like fittings in two of three dimensions and still snap together perfectly blew my mind. They even had air conditioning by putting fountains in the atriums with smart ventilation. Since depicting humans or animals is a religious taboo they instead decorate the buildings with beautiful flowers, geometric patterns and Arabian calligraphy. An aesthetic I hugely prefer to our statues of saints and paintings of Jesus on the cross. Lastly, having the whole congregation kneel together on the carpet on the ground conveys a much stronger feeling of community than rows of hard wooden benches. Very, very impressive indeed. We participated in two organized day trips. One of them included a cliche carpet sales pitch. Turkish carpet salesmen are legendary and we soon understood why. A perfectly orchestrated event with just the right amount of informational content, bonding and sweet talking. Going in I had no clue about carpets. In the end my mind was entertaining ideas of where we could put one in our flat and which type I'd prefer. The sales pitch masterly anchored the various price points (wool vs cotton vs silk) and understood how to plant the seed of desire. Devious. The other day trip included a Bosphorus cruise. Passing palace after palace on the shore. The Ottoman empire really must have been rich beyond comprehension. From the Topkapı Palace with egg sized emeralds to the Beylerbeyi summer (!) Palace. The latter was only used during the two warmest months of the year. The sultan liked the cool breeze directly at the sea. To get an idea of the scale of the thing consider that a carpet that seemed small in the palace was 120 square meters in size. Larger than your average apartment. But a ceiling height of 8 meters puts everything into perspective I guess. What struck me is that some of these palaces were still being used in the late 19th century. The oldest person alive recently celebrated his 116th birthday. That you can have Sultans and the iPhone 5 within the span of a single human life boggles my mind.